I bought a ukulele after a week of watching Adventure Time videos with my son. Such is the power of kids' cartoons. SOME kids' cartoons, I hasten to add. Many are terrible. Caillou, I'm looking at you here. I have a friend who managed to get through his kids' younger years while imposing a strict 30-minute daily diet of children's television viewing. I used to admire his discipline but now that my son is 6 years old I regard this as an excessively rigorous rule. For parents. Clarence chronicles the misadventures of the 4th-grade title character and his friends, Jeff and Sumo. Spoiler Alert! The mystery piñata from the pilot episode is actually filled with bees! Fun fact! IMDb tells me that Jeff's appearance was inspired by Steve of Minecraft fame. I've loved Gravity Falls from that very first scene in season 2 when the main characters pretend to hork (as my son would say) on each other with silly string. A big part of the appeal of The Amazing World of Gumball is the choice to have actual kids voice the main characters, Gumball, Darwin, and Anais. Uncle Grandpa is pleasantly bizarre. Good mornin'! 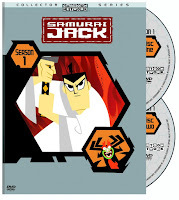 Samurai Jack is back! New episodes of this smartly animated cartoon are due to air in 2016, though without the talents of Mako Iwamatsu, the original voice for the evil antagonist, Aku. Even so, exciting! Finally, Adventure Time has the best words. And ukulele songs.